A crippled yet sprightly old man enters the Moti Bagh colony of Delhi. He is dressed in an orange kurta, which has his mobile number and the words “medicine bank” printed on it. He goes from door to door asking for unused medicines so that they can be supplied to those in need. 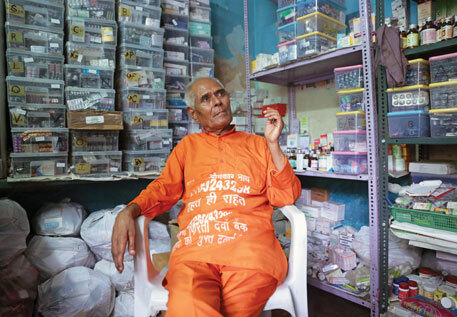 Meet OmkarNath Sharma, 77, the walking medicine bank. Despite having difficulties in walking, he covers at least a few kilometres every day to collect the drugs. Children call him “medicine baba”. On reaching the G-block of Moti Bagh , Sharma starts calling out, “Please donate medicines which are not of your use”. He then visits the house of RoopKishan Ram Jhingron, whose son had telephoned Sharma to donate medicines. “We had consulted several doctors for our father who is on dialysis, and almost all the doctors changed the medicines, leaving us with lots of unused drugs. Retailers don’t take them back,” says Jhingron’s son. “The box also contains heart medicines, which we had bought for my wife who recently underwent a minor heart surgery,” he adds. Sharma checks the expiry date of all the medicines and puts the unexpired lot in his polythene bag. Sharma, who started the service seven years ago, donates the medicines to charity hospitals to be given to the poor for free. He walks out of Jhingron’s house and continues calling for medicines. A man calls from the top floor of an apartment, signalling to Sharma to stop. He comes down with a pack of medicines. Sharma thanks him and gives his cards to be passed on to others. Two more men hear baba’s call and hand over medicines. With his bag full of medicines, Sharma limps towards a nearby bus stand for a bus to West Delhi’s Monglapuri area, where he lives. On board the bus, he speaks to the passengers about his work and gives them his card. “Call me if you have medicines to donate,” he says. In Sharma’s house—a two-room rented accommodation where he lives with his wife and son—one room is full of tall racks covered with medicines. There is a refrigerator to store injectables, including human albumin, a bottle of which costs around Rs 4,000. On one side is a computer with records of all medicines, such as date of manufacturing and expiry, quantity and place of collection. A single bed is kept next to one of the of walls, half of which is covered with medicines. This wall is pasted with newspaper cuttings featuring Sharma’s work. He sits on a chair wearing a calm smile on his face. The most striking aspect of Sharma is his straightforwardness. “I see myself as a beggar and feel no shame in begging for medicines,” he says. “I have seen people dying because of their inability to access or afford medicines,” he adds. Sharma hails from Udaipur in Rajasthan and came to Delhi in search of work about 50 years ago. He worked as a lab techinician at a private hospital in Noida. Today, he is very satisfied that he is putting his life’s to some good use. It was in early 2008 that he found his life’s purpose. One day, while returning home, Sharma came across a tragic accident. An overhead metro rail track had collapsed in Karkardooma area of Delhi and many workers had got injured. They were taken to Guru Tegh Bahadur Hospital. “I assisted in the aid effort but found at the hospital that the staff were turning away many of the injured, saying that medicines were not available,” he recalls. “Even the regular pain-relieving medicines were not available. And the kin of the injured were too poor to afford the drugs.” This jolted him. He came home and decided to do something about it. “I googled to find out if there was any medicine bank in the country. I couldn’t find any,” Sharma says. It occurred to him that he had lots of unused medicines at home. These could be of use to others. “I thought that while some government hospitals do take back unused medicines, people generally don’t want to take the trouble to go back and return them,” Sharma says. This made him realise that medicines need to be collected. And he decided to do something about it. How does he sustain his family? “God has been kind,” he says. “Since I started this work, I have been getting donations, enough to make ends meet,” he adds, saying his family too has been supportive. He points to his wife Sheila, quietly sitting outside the room. “Initially, I thought he had gone crazy. I didn’t like to see him beg. But gradually, I understood the importance of his work,” says Sheila, adding that she feels happy looking at her husband’s pictures in newspapers. Sharma plans to start his non-governmental organisation (NGO) now. Over the years, he has developed associations with other health NGOs whose doctors accompany him to slums in Delhi to check patients and give free medicines. He says he sent boxes full of medicines to Uttarakhand when the flood struck last year. In association with the retail chain Vishal Mega Mart, Sharma has also got boxes placed at their stores in 150 locations across Delhi to collect unused medicines from customers. One wonders if Sharma ever gets tired. “I do. And more often now because of my age,” he says. “I take rest when required. I try not to miss weekends as most people are home ,” he adds. “Medicine baba kaeksapna, gareebonka medicine bank hoapna (There is only one wish of medicine baba, that the poor should have a medicine bank they can call their own),” says this ordinary looking man with extraordinary courage, sharing his dream before retiring for an early dinner. Such a great job doing by Mr. Sharma. I am very thankful for doing such job. As have gone through Kidney transplant. Some of medicine which was change by doc. now not is use. Same i wanted to donate. I live in ghaziabad and work at Noida . Pls let me know if i can donate near by Noida or Ghaziabad. I have many medIcine can I donate and where to donate. It's great that Sharma ji is doing noble service of the society. Some Allopathy medicines are unused for me and these are in within the expiry date, pertains to diabetic and hypertension, Please let me know how to donate the same. PLEASE SEND THE ADDRESS TO WHICH THE UNUSED MEDICINES ARE TO BE DELIVERED. I have lots of medicine for donation ...pls help me to reach Medicine Baba. I have some unused medicine live in Krishi Vihar, N.D. near chirag delhi, Masjid Moth can you suggest a near by place where l can donate these medicine.